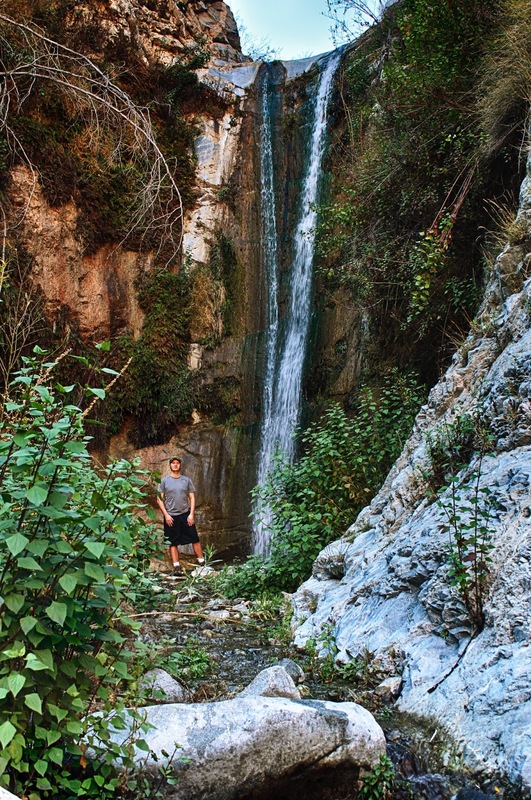 After several years of being closed, Trail Canyon Falls is finally open again. With some nice weather in the forecast, I decided to drive up today and check it out. The last time I visited Trail Canyon Falls 2 years ago was a disaster. 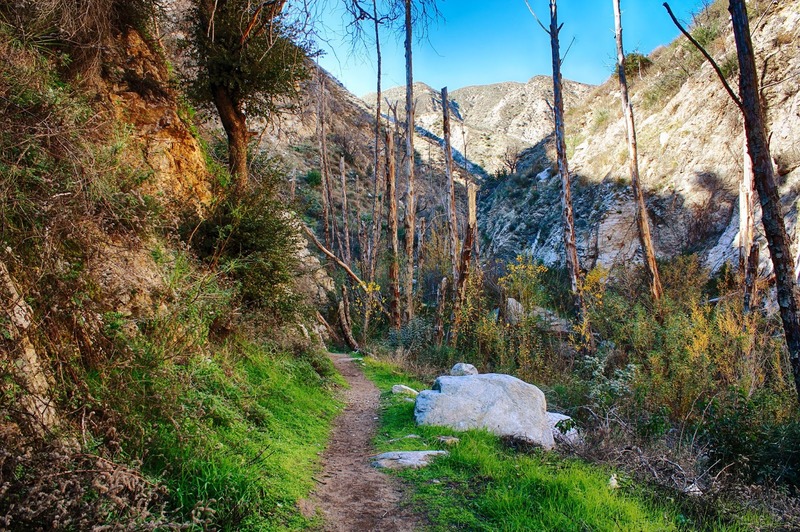 The trail had been neglected for several years after a large forest fire and was nearly impassable because of thick vegetation and flood damage. We took several wrong turns, forcing us to walk upstream in the creek at a time when the water levels were unusually high and the currents truculent in the best of places. We never did make it to the falls, giving up when we were less than a half mile away. To top it off, we were attacked by a 4 foot long rattlesnake on the return to the car. I was pleasantly surprised this time around to see that the entire 3 mile trail had been completely repaired. Even the parking area for the trail had been restored and widened. 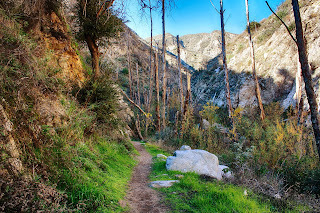 To get to the trailhead from Sunland, follow Big Tujunga Canyon Road North for approximately 4 miles to a small dirt road on the left side labeled on most maps as North Trail Canyon Road. Turn left and follow North Trail Canyon Road for ¼ mile to the parking area. From the parking area you follow a wide gravel road through the locked car gate and up the hill, passing by a few sporadic cabins. There are 1 or 2 signs indicating the waterfall is ahead. After a half mile or so, you will descend back down the creek and come to a small junction in the trail. The left hand junction dead ends after a hundred feet at some abandoned farm equipment and the ruins of a small cabin. Take the right hand junction and continue to follow the creek. The trail is wide, well maintained and quite obvious. You will have to make several small stream crossings. Another half mile in and the trail will cross to the left of the creek and you will gradually ascend to the top. This part of the trail is moderately strenuous, completely exposed to the sun, and probably inappropriate for small kids. After gaining a 1,000 feet or so of elevation above the creek, you will round one last corner and the waterfall will come into view. The waterfall is about 50 or 60 feet tall situated in the middle of the canyon. From the other descriptions I've read, it flows for most of the year, regardless of the rain. The climb down from the trail to the top of the falls is relatively easy. There are a few cool spots to take some pictures at the top of the falls. Getting to the bottom requires some effort and a willingness to get dirty. I put my hand on a tree branch to steady myself on the way down the cliff face and was promptly attacked by a swarm of biting red ants. The canyon floor was also overgrown in a few places with those stinging water nettle plants, so watch where you put your hands. I had a much better time at Trail Canyon Falls this time around. I want to come back in the spring after the snow begins to melt and the falls are ferocious.